6 Options to choose from. for these high quality exhausts. 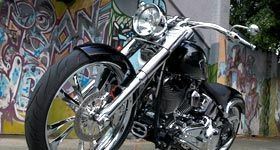 WestSide Customs has a range of custom bikes for sale. Check out what’s available at the moment or give us a call, we may have your dream bike here ready to go right now! 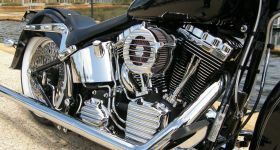 Massive range of only the world's finest quality aftermarket products for Harley Davidsons. THE FORMULA IS SIMPLE. GREAT LOOKING QUALITY CUSTOM BIKES YOU CAN RIDE! 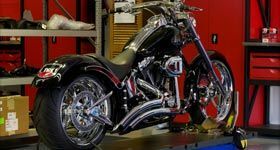 Here at WestSide Customs we specialise in the custom transformation of late model Harley Davidson® Motorcycles in our modern, clean, professional workshop facility, we offer a range of enhancement packages which can be individually modified to suit all tastes and ideas as well as pre customised second hand, very low kilometre Bikes ready to go off the showroom floor. We use and sell only the world's best quality aftermarket parts and can offer you all the time and advice you need to build the bike you have in mind, whatever it may be, you don't even need to own a bike to come and see us. 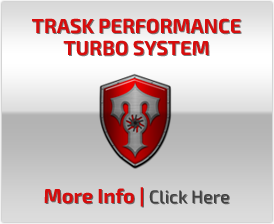 If there is nothing on our floor that grabs you, we will source you a bike to start your custom build, plus of coarse sound scheduled servicing, repairs and performance work including being a Trask Performance Turbo Systems official fitment centre. Our user friendly website enables you to choose from many of our innovative enhancement packages with sections specifically for Softail®, Rocker®, V-Rod®, Touring/Bagger and Dyna®. Browse through the gallery of our latest builds as well as find information on our other services such as professional photo shoots and bike detailing. The passion and dedication we see throughout the custom Harley-Davidson® motorcycle industry continues to inspire us. The continued search to discover new ways to enhance their bikes and make them unique to each individual rider is a driving force amongst this industry and especially for us. Reflecting our commitment to learning and continuous improvement, we welcome your feedback as we continue to improve this site. Call us today on (08) 9390 0050.